:Owen was a normal high school student with a great life. He had a beautiful girlfriend, played on the football team, and was surrounded by a group of great friends. That is, until he found a well on some abandoned land, and a man who offered him a drink of water that changed his life forever. Suddenly, Owen is seeing things that no one else sees: Shackles and chains that bind his family and friends, terrifying creatures that connect themselves to the cuffs attached at the end of the chains, and angelic beings who seem to have a power that even the demons cannot withstand. Do the things Owen is seeing have anything to do with the suicide epidemic currently threatening to destroy his high school? How can this young man with no faith in the supernatural suddenly see invisible forces of terror provoking his fellow student's demise? 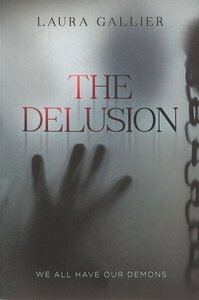 Similar to Frank Perretti's This Present Darkness and Piercing the Darkness, The Delusion explores spiritual warfare in a fresh way, reminding us that We All Have Our Demons. About "Delusion, The: We All Have Our Demons (#01 in The Delusion Series)"
Pre-Order now to secure your copy. Expected to ship November 2019. Expected to ship within 8 hours from Australia.